(4 stars) very handy charger. I have used this charger for a few weeks in several cars. I have connected it to Dell tablets, iPhone phones, Android phones Fitbit devices without any issues charging. The charger comes in a small package just slightly bigger than itself and without any instruction (not that any is needed). The charger is made of plastic and very sturdy as it does not creak or deform if squeezed. I am sure it will last a long time. When the charger is connected and has power it has a light turns on above the USB ports. The charger itself is physically twice as long as the receptacle it plugs into. What this means is that when plugged into the car it is about half as long as not plugged in. This causes an issue in my BMW 323i as I cannot close the arm rest. I have used other chargers that are barely longer than the receptacle and they work without any issues. This charger is just physically too long. So far I have not had any problems with actually charging my devices, however because I cannot close the arm rest in my car while it is plugged in, I am not able to keep using this regularly. I received this product in exchange for an unbiased review. 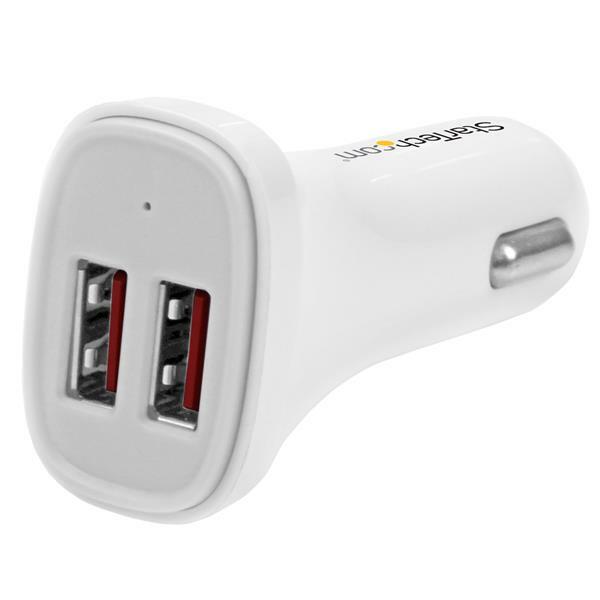 Some usb car chargers are only 1A per port or will have one port 1A and the second port 2.4A and they don't quite do the job. However this charger has 2.4A per port and is enough that I was able to use this with my mobile phone and an iPad and to charge both devices simultaneously and while in use (navigation on phone and passenger using iPad). The small sleek design is a plus and the small non-intrusive indicator light shows when it's being used. Quality product. I received this product in exchange for an unbiased review. The shape and size of the adapter allowed for it to be plugged into any of the 12V-24V (DC) slots in my vehicle. This adapter allowed my cell to charge quickly while also using my tablet plugged into the second outlet. Disclaimer - I received this product in exchange for an unbiased review. This USB car adapter is more powerful then other ones out there and has enough power to charge two tablets at the same time. It can also charge smart phones as well as we tested that out on a car trip with the family. The smart phones seemed to charge faster than our old one. The neutral white colour is a nice touch as it will look nice with any colour interior. This product feels well constructed and made to last. A great buy. I received this product in exchange for an unbiased review. 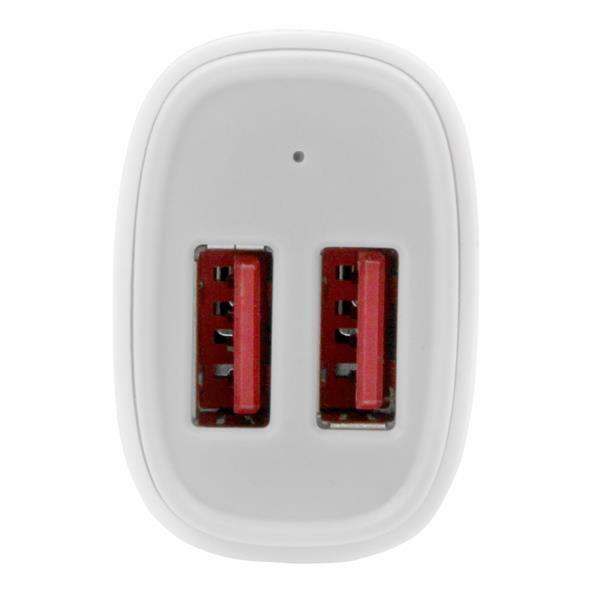 (5 stars) Powerful little charger! I have been in the technology business for over 35 years and for the past 20+ years I have been asked to provide unbiased reviews of various products from both the AV and IT world. In review of this product I have found that the high power this device delivers allows for the charge of two tablets simultaneously. 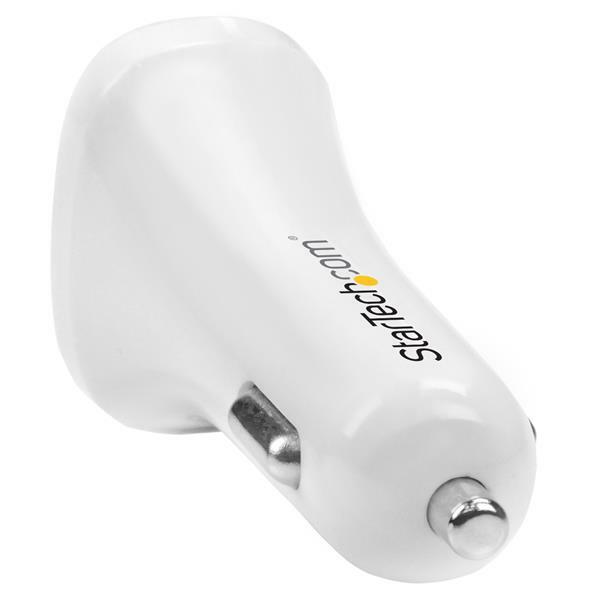 Also, because of the Smart IC technology the device has on board, your device receives the optimal charge for your specific device eliminating the "slow charge" message usually associated with off the shelf car chargers. This device works on a wide range of electronics such as Apple, Windows and Android tablets and Phones. 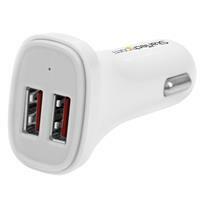 In the box: -2 Port USB Car Charger In summation, solid product, excellent performance. I received this product in exchange for an unbiased review. I appreciate that both the ports on this USB power adapter supply max power to your devices. Many car adapters have a 1.1A and 2.1A port. I also like that this is easy to remove. I've had others that are so flush with the power port that you cannot remove them, or see them since they are black. I received this product in exchange for an unbiased review.